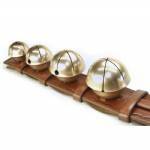 This rump strap has 8 antique traditional Swedish bells. The medium brown strap is about 30" long and 3" wide with a decorative border stamped around the edges. We installed a dee on each end so the strap could be securely tied onto a harness or conveniently hung from a hook.